If you are planning a trip to Morocco, the small town of Essaouira is one you should not miss during your trip! It’s only 2.5 hours west of Marrakech and you’ll find that it is far more laid back and far less conservative than its neighbor. Some tourists choose to take a day trip to Essaouira but we would highly recommend spending at least a few nights here (we loved it so much that we ended up staying for 3 weeks!). Essaouira is full of expats who call this windy coastal town home. They love the delicious restaurants, lively rooftop bars, and friendly locals – and you will too! 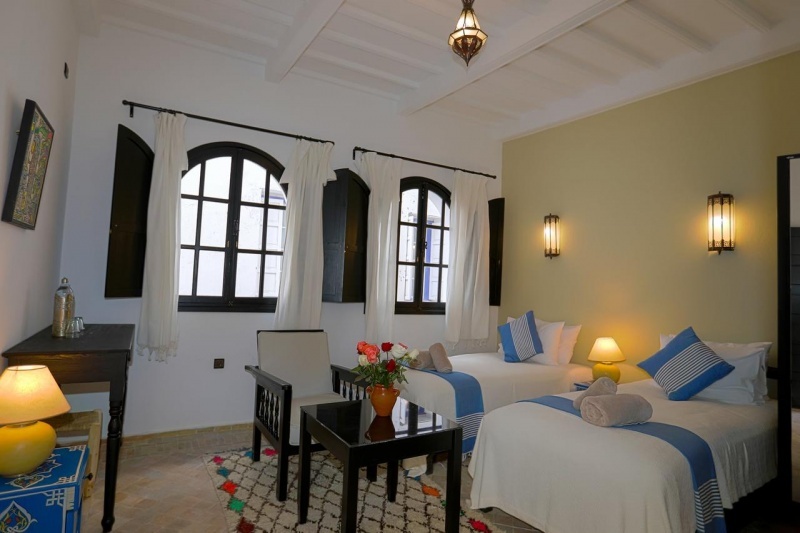 Essaouira is also full of traditional riads that will make your vacation here truly memorable. Check out our list of 10 amazing riads and villas that you will absolutely adore during your stay in Essaouira! This spectacular, ornate villa is an Instagrammers dream! While not necessarily a traditional riad, this villa will make you feel like you’re staying in a Moroccan palace. Intricate tile and stonework cover the walls and ceilings while lush textiles and metal lamps create a cozy lounge area. It’s impossible to take a bad photo here! Rooms are large and outfitted with every amenity you could ask for. When you’re not relaxing in your private room, you can enjoy the large outdoor pool and surrounding garden. It’s a little peaceful oasis and the perfect place to spend a sunny afternoon. The Villa Quieta is located a bit outside of the medina, right on the beach. You’ll love getting the opportunity to watch kiteboarders gliding across the ocean during sunset, from the comfort of your own room. The walk into town is quite lovely, right along the boardwalk that borders the beach. The Riad Chbanate is a gorgeous riad, right on the city wall. You’ll find beautiful stonework, intricate woodwork, and lovely traditional decor throughout. The stone and the dim lighting create almost a cave-like feeling here. Rooms are spacious and all overlook the interior courtyard. Many rooms have their own private fireplace to cozy up to in the wintertime. All rooms come equipped with air conditioning, a tv, and various other amenities to make you feel right at home. Guests love the delicious breakfast served every morning and the incredible staff that is always ready to help. And the rooftop is the perfect place to escape the hassle of the medina. 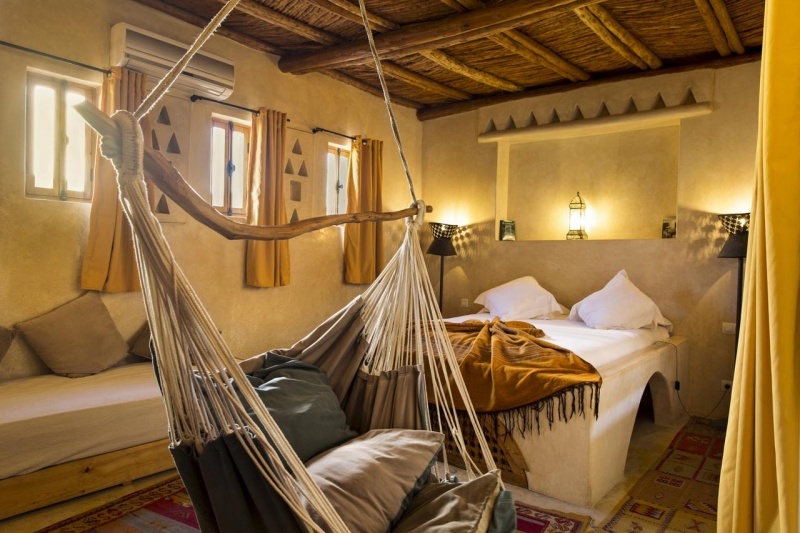 It’s worth paying a bit more to get to stay in this gorgeous, luxurious riad! 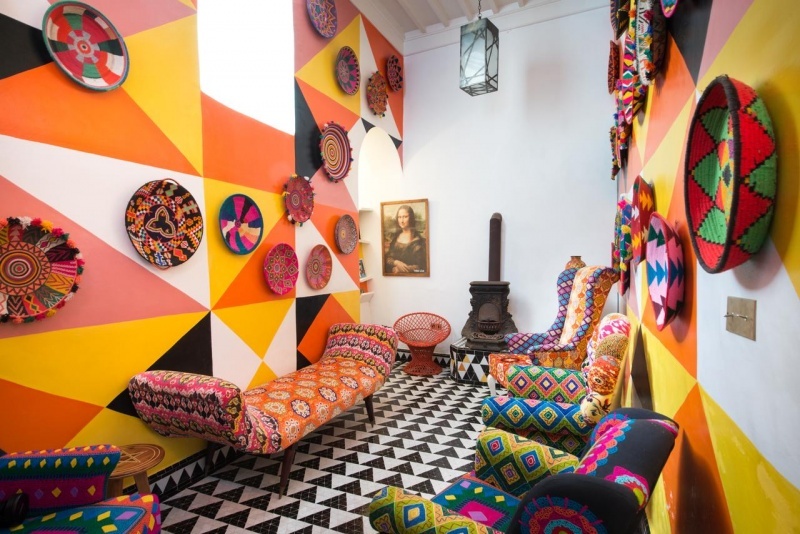 If you are looking for a fun, funky, and vibrant riad during your stay in Essaouira, you absolutely must check out the Salut Maroc! The walls are filled with colorful murals and every piece of furniture has been custom-made. You can’t help but take photos in every room at this beautiful riad. The rooftop terrace is covered in colorful tiles and offers spectacular views of the sea. Even if you don’t stay at this riad, you’ll want to visit their rooftop bar and enjoy a mint tea with a view. You’ll love the awesome Instagrammable copper bathtub in your totally unique room. 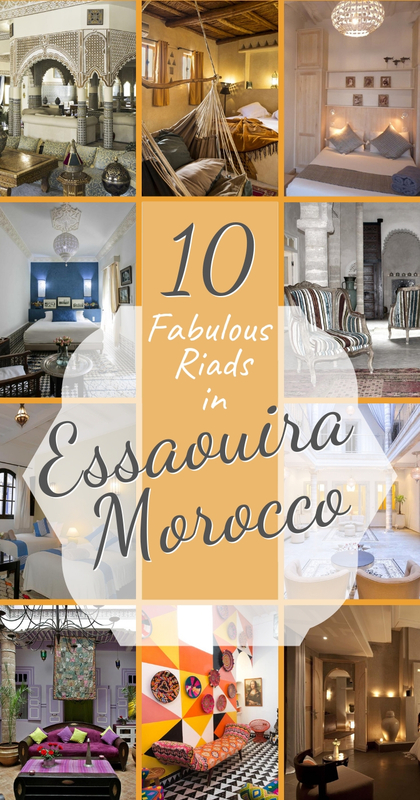 It’s truly unlike any other riad in all of Morocco! 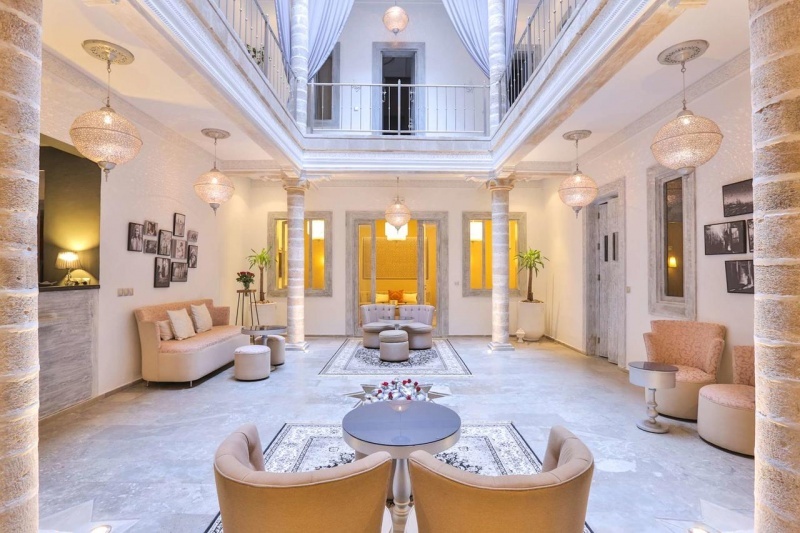 Located in the heart of the medina, this charming little riad is run by the friendliest hosts around. You’ll feel like family here! From the moment you arrive to the moment you leave, the entire staff will work hard to ensure that you have an amazing stay. Rooms are spacious and comfortable with your own little private seating area and free toiletries. Each room is unique and much care has been put into creating a space that feels both traditional and modern. You’ll sleep well in these lush, comfortable beds. The beautiful terrace has plenty of sun beds available for an afternoon of lounging in the sun. You can enjoy your traditional Moroccan breakfast on the rooftop or in your room at your leisure. Natural colors and beautiful Moroccan lamps fill this luxurious riad to create an enchanting haven in the middle of the medina. Guests can take advantage of the beautiful rooftop terrace, hot tub, library, and hammam. When you arrive you’ll be welcomed in the central garden with a drink and traditional Moroccan snacks. Rooms are clean and comfortable with classic, elegant decor. 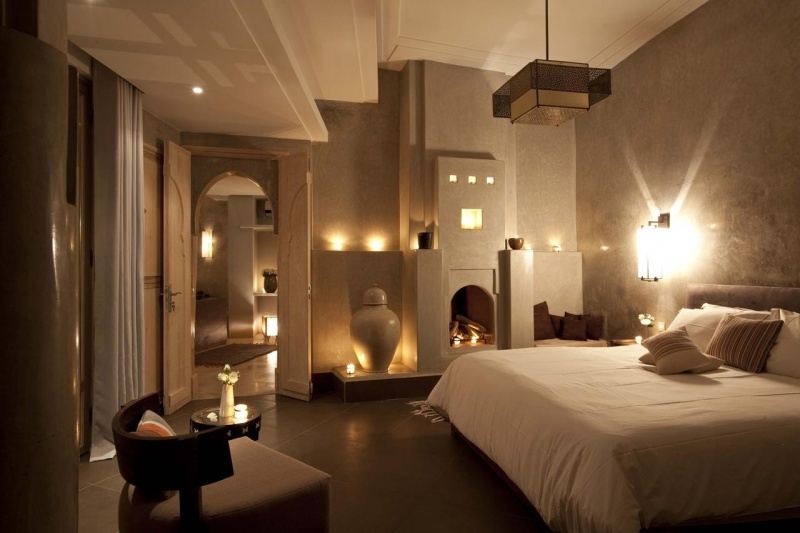 You’ll love having your own private fireplace in your room on chilly nights in Essaouira. Bathrooms have a large bathtub, perfect for a soak at the end of a long day at the beach. Enjoy a hearty breakfast on the rooftop terrace and then return at sunset to have a cup of tea and enjoy the view. The newly renovated Raoud Rayhane is an absolutely gorgeous riad with the friendliest manager! 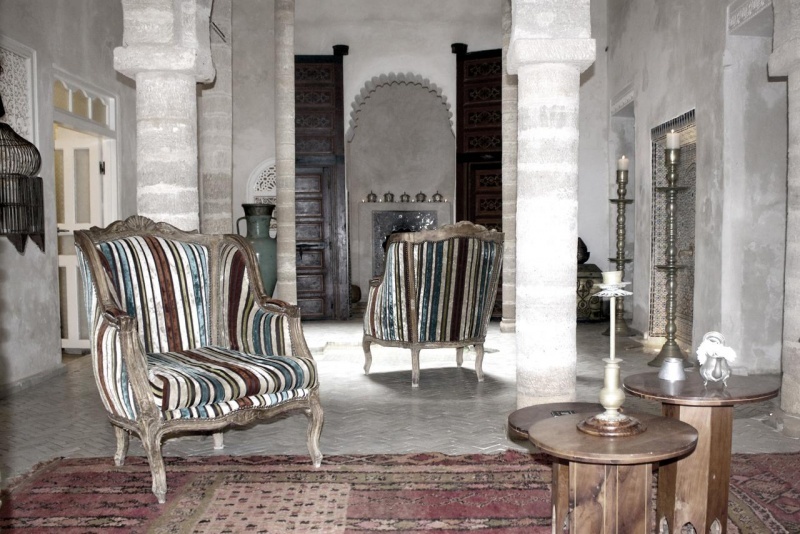 The riad has classic decor in muted tones and beautiful stonework throughout. The public seating areas are peaceful and you’ll love cuddling up by the fireplace with a book on cold days in Essaouira. Rooms are spacious, comfortable, and impeccably clean. 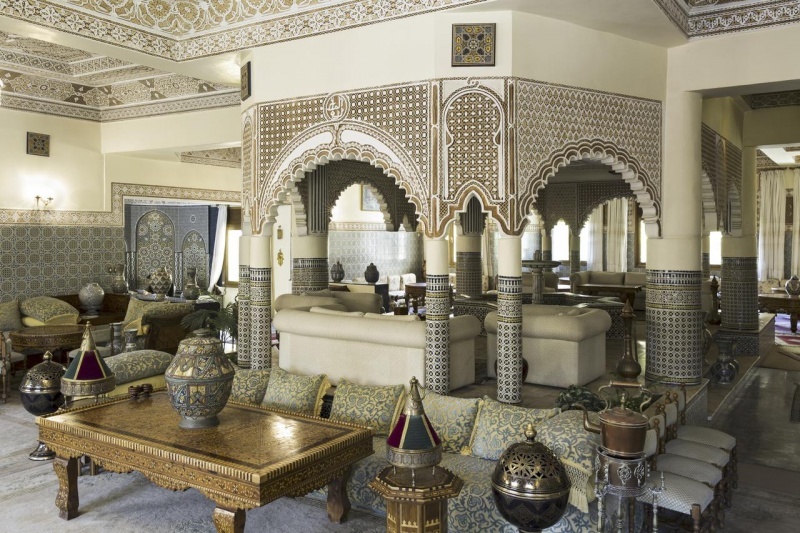 Wifi is available throughout the riad and all of the rooms have flat-screen television sets. Some rooms have private balconies that you can enjoy on sunny days, or you can head up to the rooftop terrace where you’ll find plenty of comfy lounge chairs. Be sure to book a massage in the onsite spa center and hammam! It’s a great way to relax and unwind and the prices are totally reasonable. 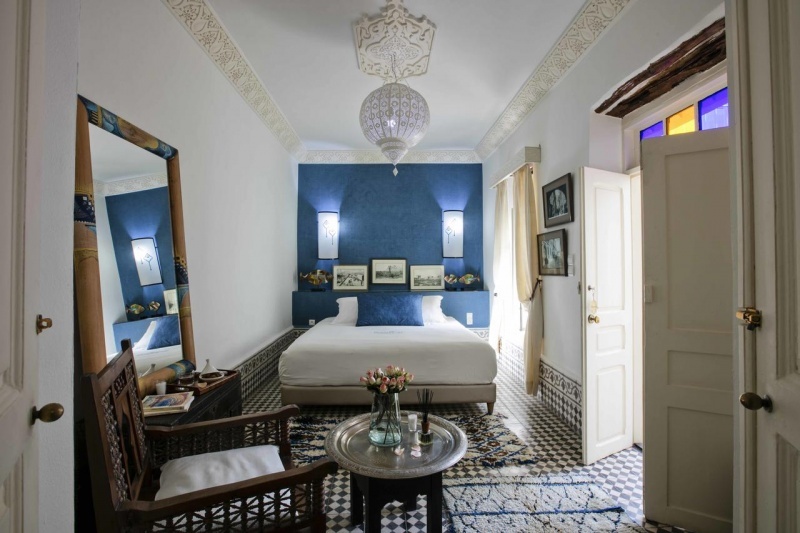 You’ll love the classic Moroccan touches around this charming little riad. From the traditional tile to the beautiful stonework, you’ll appreciate all of the care that has gone into preserving the original architecture. Rooms are cozy, comfortable, and quiet – perfect for a good night’s rest. The rooftop terrace at Riad Malaïka can’t be missed, and you’ll most certainly want to dine at the in-house restaurant; the food is unbelievable! Be sure to try the lamb tagine. You’ll especially appreciate how every member on staff goes out of their way to make you feel welcome. Some riads in Morocco can feel dark and cave-like but the rooms in the Riad Dar Awil are light, bright, and airy! 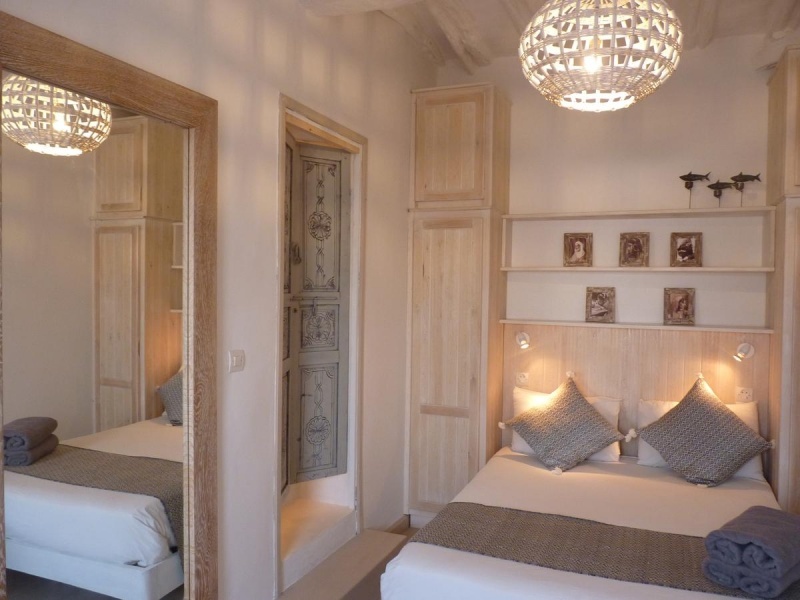 The beds are so comfortable and you’ll love the decor throughout the riad. And the location is central and close to everything. Be sure to have a cup of mint tea on the rooftop at sunset for beautiful views of the medina! Guests absolutely rave about the complimentary breakfast that is served each morning. And the staff at the Riad Dar Awil are so attentive and willing to help with anything and everything to make your vacation perfect. You’ll feel right at home here. The Riad Garance is beautifully decorated with a blend of Arabic, Berber, and Jewish design influences. The location of the riad is within the city walls and only a short, 5 minute walk to the beach. Rooms are large and bright with windows opening onto the street below. Organic toiletries are available for guests to use during their stay. The peaceful rooftop terrace offers fantastic views, comfortable seating areas, and some shade in case the sun gets too intense. It’s the perfect place to enjoy your delicious Moroccan breakfast every morning. 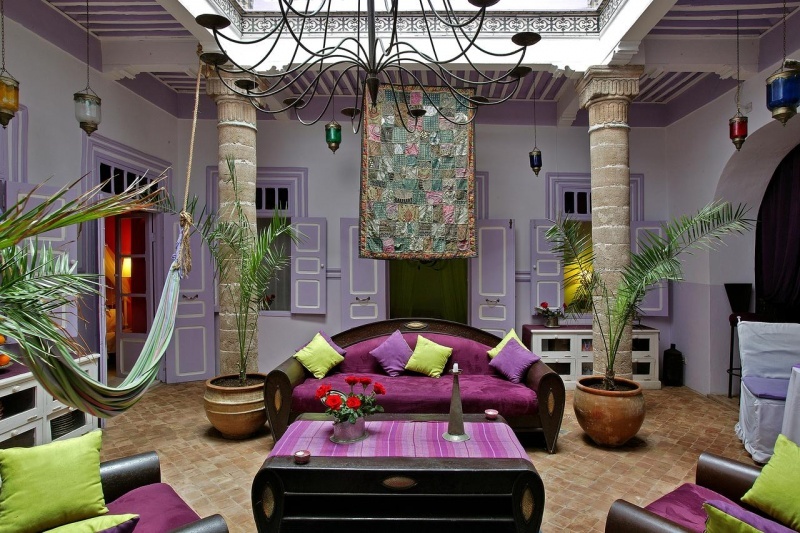 This eclectic, colorful riad was once owned by a wealthy spice merchant and has been transformed into a wonderful place to spend a few nights during your vacation in Essaouira. The central location is close to restaurants and shops. All of the rooms are unique, charming, and colorful. You’ll love the comfortable public areas and the rooftop terrace. The friendly staff are readily available to help you with anything and everything you need during your stay. Rooms at the Casa Lila & Spa are reasonably priced so you can splurge on a massage at the onsite spa and hammam! Looking for more things to see and do around Morocco? Check out our favorite guidebooks!